Today I have the great pleasure of sharing with you a new book written by my editor and friend Ev Bishop. I have read two of her books and absolutely loved them. I can't wait to dive into this one as well. So it you are madly scouring the internet for something new to read, this might just be the ticket! 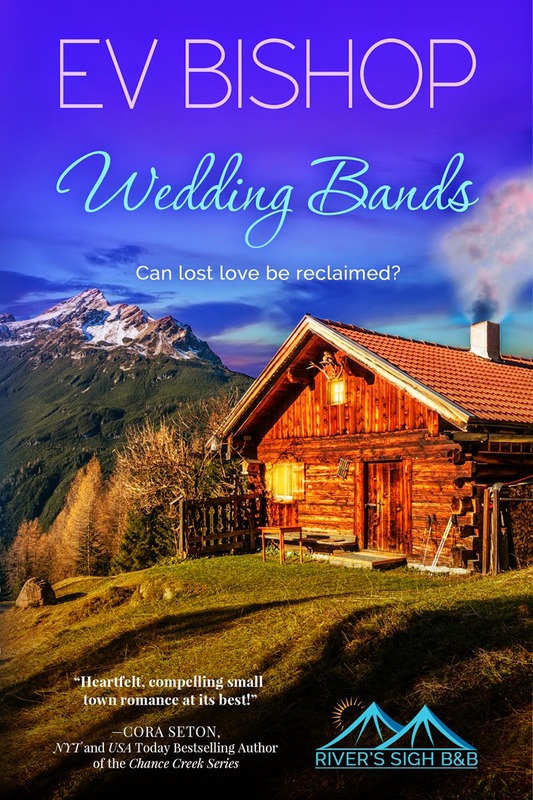 Wedding Bands, Book 1 in the River's Sigh B & B series. Ditched by her high school sweetheart, Callum Archer, on the night they’re supposed to elope, Jo Kendall casts out on her own, brokenhearted. Over the years, Jo reels in a life she loves, centered on the outdoors, fishing (favoring a lucky wedding band lure), and her fine dining restaurant—a life that crashes away when her husband and business partner cheats her, leaving her bankrupt and alone. Then her uncle dies, bequeathing Jo and her sister, Samantha, his rural property. Jo returns to Greenridge, determined to build a new business and permanent home—without the help of a man. Unfortunately Samantha wants her inheritance in cold, hard cash and hires a lawyer to get it for her, a lawyer who turns out to be none other than Jo’s long-lost love, Callum. Jo’s fledgling plans—and her heart—are at risk once more. If Jo can fight her insecurities, she might end up with a wedding band that doesn’t come with a sharp hook. But should she risk everything she’s worked for, yet again? Before she can decide, she needs to know: can a lost love truly be reclaimed? Don't have an eReader and/or prefer print books? Wedding Bands will be out in paperback at the end of the month, available for order at your favorite brick and mortar bookstore. A bit about Ev Bishop . . . She's a longtime columnist with the Terrace Standard, and her other non-fiction articles and essays have been published across North America. Her true love, however, is fiction, and she writes in a variety of lengths and genres. If you’re a short story lover or read other genres alongside Romance, visit www.evbishop.com to learn more. Some short story publications include: “Not All Magic is Nice,” Pulp Literature (forthcoming), “The Picture Book,” Every Day Fiction Magazine, “Riddles,” 100 Stories for Queensland, “On the Wall,” Every Day Fiction Magazine, “My Mom is a Freak,” Cleavage: Breakaway Fiction for Real Girls, “HVS,” “Red Bird,” and “Wishful,” (available through Ether Books). Women’s Fiction novels include Bigger Things (Winding Path Books 2014), which is available in digital or paperback wherever books are sold, and Mosaic (forthcoming). She also writes romance under the pen name Toni Sheridan (The Present, Pelican Book Group, 2012, and Drummer Boy, Pelican Book Group, 2014). Ev loves to connect with other readers and writers, so please consider subscribing to her newsletter and/or visiting her on Facebook and Twitter.